This flagholder was found in New Jersey on a fairly recent tombstone. 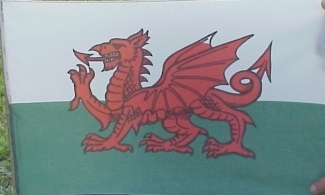 The flag was in a generic holder beside the tombstone of a man born in Wales and his wife, born in England. 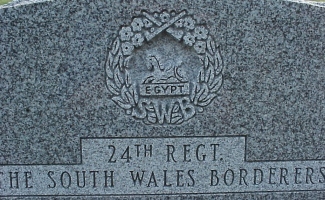 The insignia of the South Wales Borderers was inscribed in the tombstone with the Egypt designation in the wreath above the S.W.B. initials. I am guessing that this man did military service in Egypt. See the South Wales Borderers Web Site for history in World War Two. The site link is for an online war game but it includes and has links to serious histories of the unit. Have just arrived at you web site and looking at the SWB BADGE /WESH FLAG. I am not sure as to date you entered these details, however the stone displays the SWB regimental badge. Eygpt was battle honour earned during the Napolionic wars 1798.This regiment was also involved in America 1776-1777. There is also a strong USA/Welsh connection WW2, Burma 6th Btn SWB along with others, forming the 36th Division, were under the comamd of Gen. Stilwell.